You can use ready-made puff pastry for this recipe (you'll need about 375g), but do try making your own if you have time. It is not difficult, you just need to allow plenty of chilling time. The pastry freezes well and can be made in advance and frozen until needed. To make the pastry, put the flour and salt in a processor. Dice 30g of the cold butter, add it to the processor and whiz until the mixture forms fine crumbs (alternatively, rub in the butter with your fingertips). Tip into a bowl and mix in the cold water gradually. Lightly knead on a lightly floured surface until it forms a dough. Wrap in clingfilm and chill for at least 30 minutes. Meanwhile, put the butter between two sheets of clingfilm and using a rolling pin flatten it into a 2.5cm-thick rectangle measuring about 9 x 12cm. Chill until needed. On a floured surface, roll the dough into a rectangle that is 3 times the length of the butter and about 2.5cm the width. Put the butter in the centre of the dough and then fold over each end of the dough, so that the butter is completely covered. Using the rolling pin, lightly press down on each edge so that the butter is sealed in. Give the dough a 90-degree turn clockwise. Using short, sharp strokes, roll out the dough so that it returns to its previous length (3 times that of the butter) but retains the same width. Then fold in the 2 ends again. Press the edges with a rolling pin and give a further 90-degree turn clockwise. Wrap and chill for at least 30 minutes. Repeat the rolling process, turning the pastry clockwise in 90-degree turns another 2-3 times. Chill and repeat once more. The pastry must remain cold so that the butter doesn't soften and break through the dough. Roll out the pastry on a floured surface so it is slightly larger than the top of your pie dish (one measuring about 20 x 30cm will be about right). Use the dish as a template and cut out a pastry 'lid'. Slip it on to some greaseproof paper on a baking sheet and prick the surface with a fork. Chill in the fridge. Reknead and roll out the trimmings. Cut into a 2cm-wide ribbon and line the rim of your pie dish. Set aside while you make the pie filling. Trim off any fatty or bloody bits from the chicken breasts. Cut the chicken into 2-3cm chunks. Mix the flour and seasoning in a large bowl. Heat 3 tbsp oil in a large, non-stick frying pan over a medium-high heat. Once hot, take a couple of handfuls of diced chicken and lightly toss in the flour, shaking off the excess, before arranging in a single layer in the pan. Fry briskly till lightly coloured on all sides. Transfer the chicken to a clean bowl and repeat the process until all the chicken is coloured. Add a little extra oil as you go. Reduce the temperature slightly and add the bacon to the pan. Stir-fry until lightly coloured, then mix in the leeks and carrots. As soon as they begin to soften, add the remaining seasoned flour. Cook for 2 minutes then add the white wine and boil until the wine has reduced slightly. Add the stock, lemon zest, parsley and bay leaf and boil for about 5 minutes until thickened, then mix in the browned chicken. Season to taste and leave to cool. Once the filling is tepid, tip it into the pie dish. Brush the pastry rim with beaten egg. Gently lay the pastry lid on top and seal the two layers together with a fork. You can decorate the pie by cutting out pastry leaves from the trimmings. 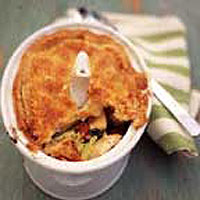 Make a steam hole in the top, or use a pie funnel. The pie can be chilled or frozen at this stage. If frozen, make sure the pie is completely defrosted in the fridge before baking. When you're ready to bake, preheat the oven to 200°C, gas mark 6. Brush the pie with beaten egg, put in the oven and immediately reduce the temperature to 180°C, gas mark 4. Bake for 40 minutes and serve hot.